Work continues on the book, but things have been quiet blog wise and will probably be that way for a while yet. So to keep you guys occupied, I figure I’ll share a link that was shared with me this morning via Chris Roberson’s blog. Bruce Ross is a guy who makes cool custom action figures, and here he takes a crack at General Ursus. 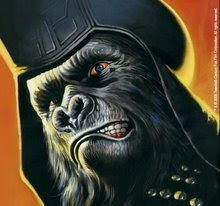 While I hardly think it’s a dead on likeness, it does make for an interesting Apes soldier at the least. Next up, he’s going to tackle Dr. Zaius. I’m curious to see how that one turns out. There are more pictures at the site along with commentary by Ross on inspiration and materials used to make it. Check out some of his other figures as well, some of them are really awesome. In the coming up department, we plan to begin profiling the artists working on Conspiracy of the Planet of the Apes sometime in October, so be on the lookout for that. And we'll have updates for you on the novel's progress, conventions we'll be appearing at and more in the months to come. Just before Comic-Con we hired POTA expert Rich Handley to serve as our editor as we get ready to move into the next draft of the novel. Rich is now nearly finished his run through of the current draft and has been nothing but enthusiastic about what we’ve done. His red pen has been hard at work despite that, because he knows we can do better, and we know we can as well. The artists involved in the project continue to move forward and hand in some beautiful work which we’ll be teasing bits and pieces of in the months to come. So all is going well with the Conspiracy. In other news, today's edition of AMC’s SciFi Scanner Daily Scan blog notes that Hulu.com has seen fit to put the entire run of the animated Return to the Planet of the Apes series. Hulu gets the episode order wrong, but someone in the comments on the Return page was good enough to post the correct order (but we know you knew that already). If you don’t have a copy of the DVD, check it out, Hulu.com streams to your computers for free. Ken Kelly is a friend to the Apes. He’s going to be contributing to the Conspiracy illustrated novel. If you look to the left you’ll see an angry Ursus daring you to click on him, that’s one of Ken’s pieces. He’s also been a friend to the crew at BLAM! Ventures since we were booth neighbors at a Big Apple Con a few years back, so we’re kind of fond of him here. While we’ll be doing a profile on him here at some point in the future, I just wanted to point you in the direction of something that showed up in my Google Reader tonight. 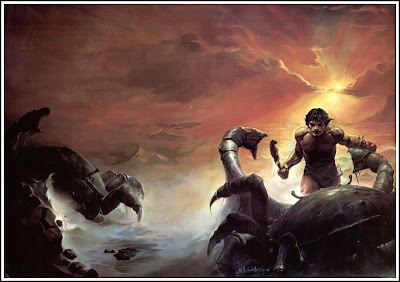 Ken’s Robert E. Howard series of painting has been featured on the Golden Age Comic Book Stories blog. It’s a gorgeous collection of paintings from the late ‘70s through to 1980. For those of you not familiar with Ken’s work (and you really should be, or we’ll have to send Ursus to “help” you get familiar with them) go check it out! Well, at least from me—others in the BLAM! clan may have final thoughts to post yet. It’s past time I finished the tale of my SDCC odyssey, however. But first, pictures! That have nothing to do with Conspiracy of the Planet of the Apes! But do have a Star Wars theme! while a bunch of soldiers tried to shoot her. Or something. 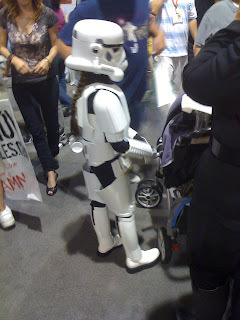 And… The Littlest Stormtrooper in Pigtails. Really, there’s not much left to talk about after the above, other than to say I had a really good time at this con. The best I’ve had in years, actually. I got burned out on them and had put a moratorium on attending for the past year or so, but I’m glad I finally made it to Comic Con. My only regret—and this is common to cons I attend away from home—is that I really don’t get to see too much of the host city. If it weren’t for the ever present Day Job and the tiny amount of vacation days I am allotted, I would love to take a few extra days to enjoy the sights, sounds, tastes and whatnot. 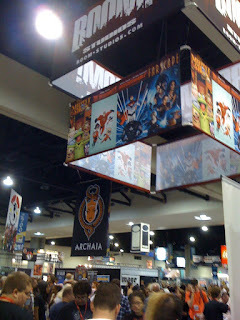 Enough of my lament, time to leave San Diego Comic Con 2009 to the history books. Yeah, one more day, then I will post it. Really. Truly. In the meantime, I'm going to do a little cross-blog promotion. My blog, The Manakalita Manifesto, is now not only a place for my personal blatherings and stories, but is also home to the first in what I hope to be a series of interviews with creators I admire. For the inaugural edition, I asked a writer familiar to The Conspiracy Apes blog: Chris Roberson. If you recall, Chris was the first--as far as I can tell--person outside of the fan clubs to write about the Conspiracy novel. His entry on us got noticed by a few others and the story is making its way onto the web in part because of that post. I had originally asked him to do an interview earlier in the year for a book he had released in late 2008, but that didn't work out. Fortunately, Chris is a pretty prolific guy, and his latest novel is out now in the UK, and here in October. That made it the perfect time to have a chat with him about the new book, and a few other things he's got going on. Please check out my interview with Chris, and I promise not to shill for my blog here anymore (than necessary). I spent most of last week down with the flu, but am feeling much better now. Just wanted to take a moment to say thanks to out neighbors at Comic Con this year, a bunch nicer people you couldn’t have asked to be next to. 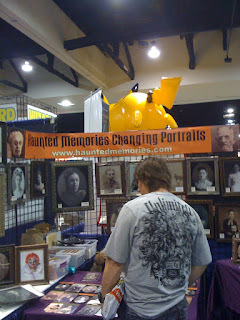 The people at Haunted Memories make creepy changing portraits–lenticular pictures that transform rather nice looking folks in antique photos into all sorts of undead, invisible, anthropomorphic and other assorted wonders. I picked up a trio of pictures while there, one for myself and the other two as gifts (well received gifts). They do custom jobs as well. On the other side were the folks at BOOM! Studios (oh the irony, BLAM! Ventures and BOOM! Studios next to each other, now if there were only a POW! Press to complete us). They get cool points for making sure our booth stayed open to traffic when their singing lines got long. I wanted to get a chance to peruse their fare, but unfortunately my other duties called. Someday I will pick up their Farscape comics, as I miss that show and am keen to see where they took it. Getting late and sleep calls, I will do a final wrap tomorrow with a couple of amusing pictures I took on my limited journeys around the main floor.